Space saving qualities and good looks of this set are obvious so I won’t go there. There are, however, quite a few additional attributes which I think are worth a mention. 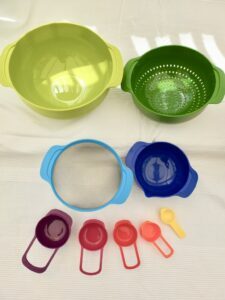 The set consists of 2 mixing bowls, colander, sieve and 5 interlocking measuring cups. 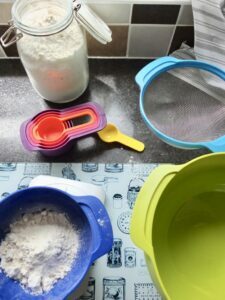 The bowls themselves have non-slip bases which are really useful if you don’t want them to be all over the kitchen counter while you mix your ingredients. There are very handy measurements on the inside of the smaller bowl which also has useful spout for when used with liquids. I love the size of the colander, perfect for draining pasta or washing salad leaves etc. The measuring cups are all your standard, useful sizes (1 cup, 1/2 cup, 1/3 cup, 1/4 cup, 1Tbsp and 1 tsp together). These sizes are also shown in millilitres. The set is dishwasher safe. 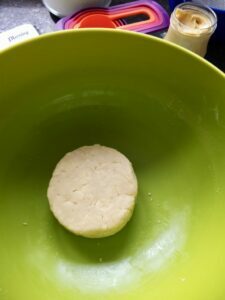 The set is not to be used in microwave which is fine although the small bowl with the spout could be quite useful for warming milk or softening butter etc. but that is by no means a deal breaker. 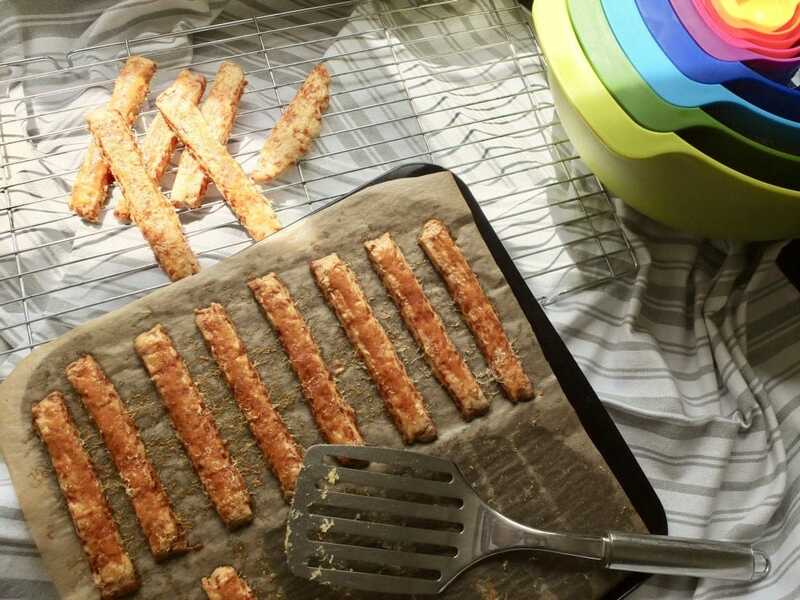 Showcasing this gorgeous piece of kitchen equipment are my delicious Cheese Straws which I made with the help of the very Joseph Joseph bowls set. 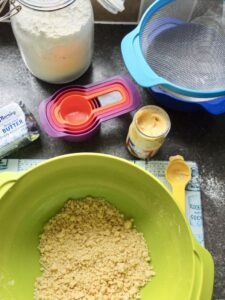 This recipe is great to make with kids as it is so easy and quick to put together. 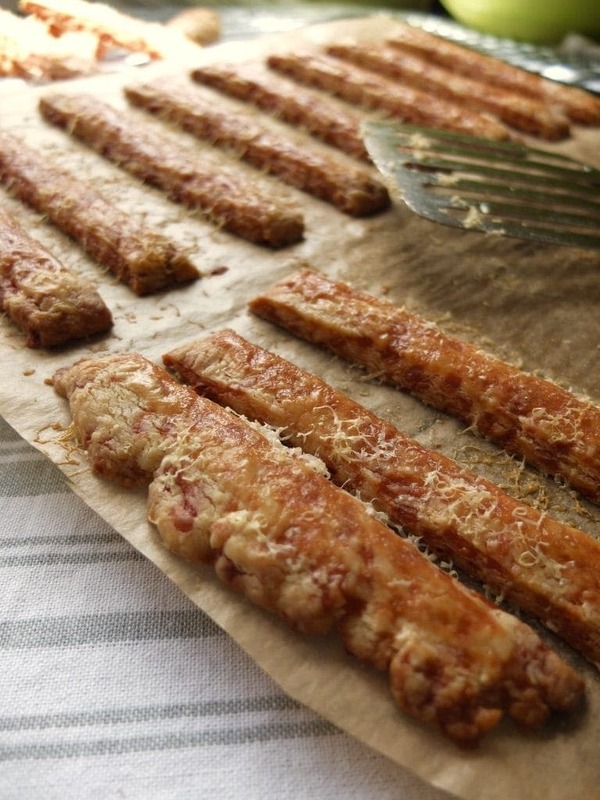 I tend to use mustard with my cheese straws but feel free to experiment with flavours and add some smoked paprika or chilli flakes. When adding dry spices instead of mustard you might want to add dribble of milk to the mix to help bind it. Now to the recipe itself. 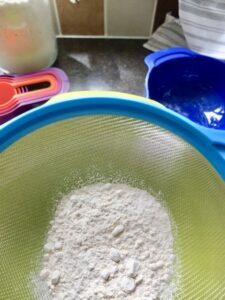 Sieve flour into the bowl and add cubed, cold butter and mustard. Rub in the butter until you reach breadcrumb-like consistency. 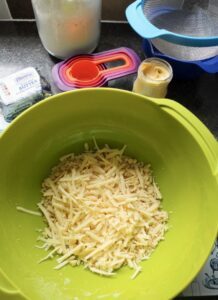 Stir in grated cheese and knead until mixture comes together. Cover it in clingfilm and let it rest in the fridge for 5 minutes. Preheat oven to 180°C and line baking sheet with grease proof paper. 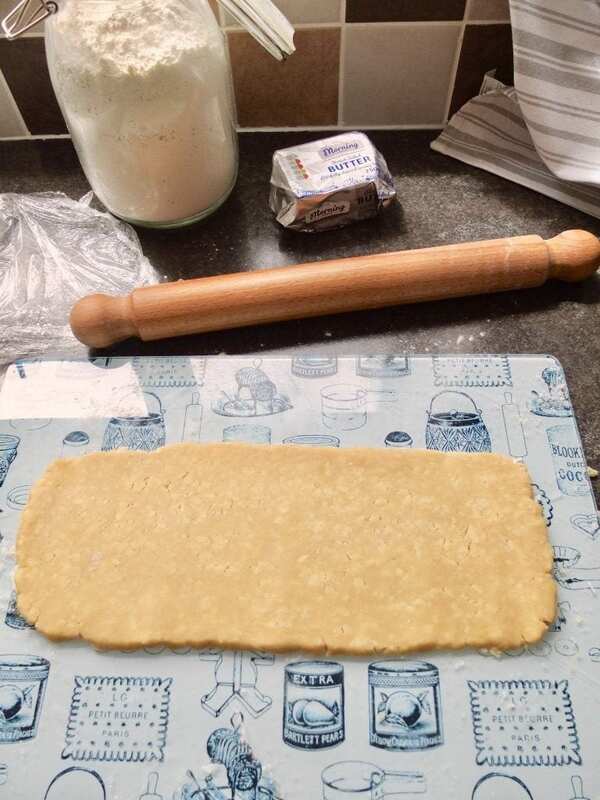 Roll out the pastry into rectangle shape (approx 32x13cm). It should be approx. 0.5cm thick. Cut into straws approx. 2cm wide. 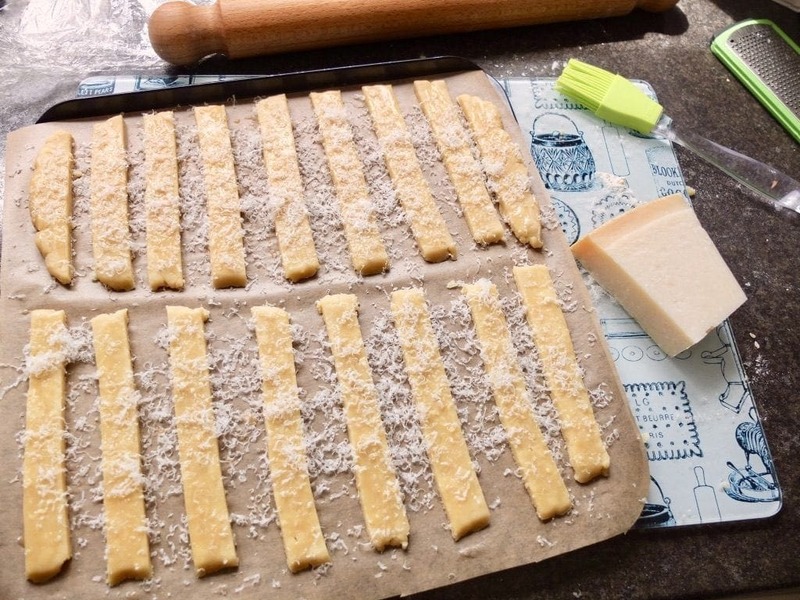 Brush gently with beaten egg and sprinkle over some grated parmesan. Bake for 10-12min until lovely and golden. That brings me to the most exciting bit which is a giveaway itself. Thanks to the generosity of lovely peeps from Steamer Trading, I have one set of very same Joseph Joseph bowls for you my lovely readers. All you need to do is to follow instructions on the gleam widget below and share with me (in the comments) your most useful and/or loved piece of kitchen equipment you couldn’t live without. Don’t worry if you don’t see your comment straight away, it will appear, I promise. 🙂 Once you’ve entered the giveaway by commenting you will have some additional options to gain more entries if you wish. The winner will be picked at random from all the valid entries after the giveaway closes. 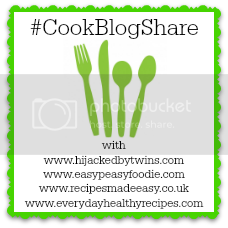 I have received free goods for writing this post from Steamer Trading Cookshop who also provided the prize for the giveaway. All views, however, are my own and I would never recommend any products to you I wouldn’t love myself. My Grandma’s 50p shaped cake tin, it’s quite shabby and very old but I love making cakes in it, as she taught me to bake! 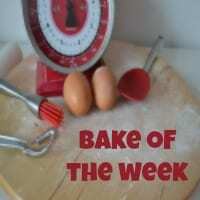 My electric whisk – I cant go back to whisking cream and egg whites by hand again! 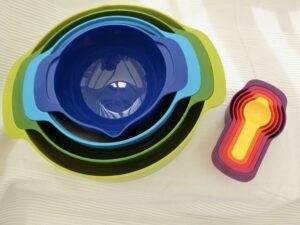 As I love the colourful Joseph bowls I’m gong to enter the giveway – what a fabulous one it is. 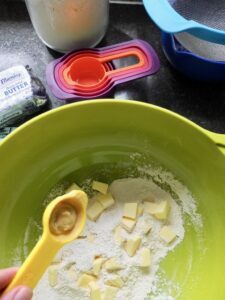 The item I couldnt live without are my kitchen knives (i’m sure no explanation needed) but more frivolous would be the kenwood chef because it takes the hard work out of batch baking. I love my electronic digital scales – they’re so much more accurate than the old scales with a finger dial and they’re great for accuracy and even measuring liquids. Bit boring but I use them at least once every single day. I don’t know what I’d do without them 😉 ! 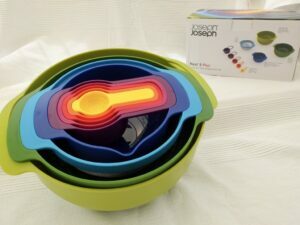 ooooh I love the Jospeh and Joseph range and have a few items. I immediately thought of my hand blender just like Monika. I especially use it in winter for soups and it’s so much easier to clean than my bigger blender. Thank you lovely! 🙂 Shame you are in Germany 😉 I am so pleased I am able to run it and offer such a great prize! I am absolutely in love with this bowl set and hope somebody else will be too!